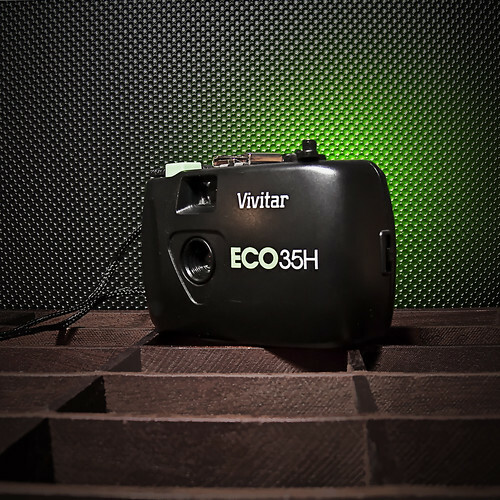 The Vivitar ECO35H was very similar to the Vivitar ECO35, but with a hot shoe, and unlike some alleged hot shoes on low-end cameras, this one is actually functional. Dating to around 1991, the camera is a very simple, very low end model, being fixed-focus, fixed-aperture, fixed shutter speed. But it had the fascinating concept of being a reusable disposable (see the article on the Vivitar ECO35 for additional info). It takes the popular 35mm film format, and does not need batteries (which may be considered a feature by some). According to an issue of Popular Photography, the lens is plastic, aperture is f/11, and shutter speed is 1/125. They called it a "polycarbonate Brownie". They loaded the camera with Ilford XP2 film, and noted "Granted, the imaging isn't quite the equal of a more sophisticated autofocus P/S, but we think you get quite a lot for the money".